Excuse me? I'm sorry, could you repeat that? Hun? What did you say? Can you speak up please? Lately I've been finding myself using these phrases more and more often. I long ago accepted that I can't watch television unless the closed captioning is on. The words I hear in songs are nowhere near what the actual lyrics are. I've even used the "Rear Window Captioning" at the movie theatre. My greatest frustration right now is that I have a really hard time hearing Liam. His voice must be at just the right pitch or tone that it gets lost in the background before it makes it's way to me. Add in a dose of ADHD, a tired Mama and the general noise level of our house and I miss more then half of what he says. So I'm going for a hearing test today. 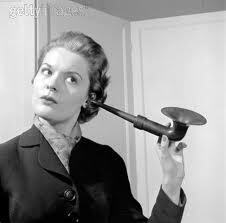 I've had at least one hearing test that I can recall, about 10 years ago. At that time they indicated that I had a slight lose (around 5%) in each ear, but it was not significant enough to do anything for it. Since I've almost ordered those bionic ears from infomercials, I'm really hoping that an actual audiologist will be able to offer a solution. Otherwise I might have to invest in a really big horn. This was Liam's Christmas gift to me this year, only the store sold out of them so I got a gift card and the care pack under the tree. They finally got them in this week so Liam and I went to pick them up. Since we can't tell them apart, we've decided that whichever one is on the left at the time will be Fred. They appear to be low maintenance and at least they don't come with live food. This now puts the pet count at EIGHT! It should be interesting next time we want to go away for a week. Of course the Greeting Cat was on hand to terrorize welcome them to our home. Fred and George will have a special place, high up on a cat proof shelf! This months Daring Kitchen Challenge was Tamales. While I've heard of them, I had never had them and had no idea of what to expect. Blog-checking lines: Maranda of Jolts & Jollies was our January 2012 Daring Cooks hostess with the mostess! Maranda challenged us to make traditional Mexican Tamales as our first challenge of the year! The first thing I had to do was find some ingredients that we didn't readily have on hand and couldn't get at the grocery store. Luckily Pete's Frootique had everything I needed. The first main filing ingredient was tomatillos. I wasn't sure if they were spicy like a pepper, but they taste pretty much like green tomatoes. I roasted them and then blended them as part of the mixture for my Green Chile Turkey Tamales. Tamales have a dough made from "Masa Mix" which is really just finely ground corn. Which is great since it makes them glutten free and I was able to invite friends over, one of whom has celiac. I made 4 tamales for each of us: 2 with Green Chili Turkey filing and 2 with a black bean vegetarian filling. It's a good thing that the friends I invited over are great friends! They knew that I was making tamales for the first time as part of the Daring Kitchen Challenge. Which was a really good thing, since the tamales were HORRIBLE! The filling tasted great (and most of us ended up scooping the filing out just to eat that) but the dough part, while it had nice flavour, was like eating paste! It stuck to the roof of your mouth and was pretty much raw, though I had steamed them for more then 40 minutes. Luckily we had a nice Mexican salad to go with it, so no one went hungry! Since everyone else at the Daring Kitchen was having great success with the recipes, I decided to not give up and try again. There had been a lot of filling left over that I had frozen, so I defrosted it, mixed up some more dough and tried again. This time I had a better steaming set up, and I let them steam for a full 2 hours (as had been mentioned by some of the other Daring Cooks). SUCCESS! The dough cooked through, was not at all pasty and Hilary and I enjoyed some wonderful tamales. I've promised my friends that they can come back another day and have some edible tamales with us. We enjoy a good cup of tea around here. While we still start our day with coffee, we enjoy a nice cup of tea in the afternoon and finish many an evening off with a nice cup of Rooibos. Even Liam will enjoy a cup of Chai with us when it's cold out. That all came out of the tea cupboard today. Some of them are at least several years old, and one I had no idea where it even came from or why we would have ever bought it. These have all now found there way into the compost and we have a nice tidy cupboard of fresh tea that even had room for the new teapot that Liam bought Hilary for Christmas.